My daughter, Andrea, is a fantastic photographer and I've learned so much from her. I asked her to share some of the simple tips that she's taught me with all of you. This is Part One of a three part series. Come back Wednesday and Friday for Parts Two and Three! 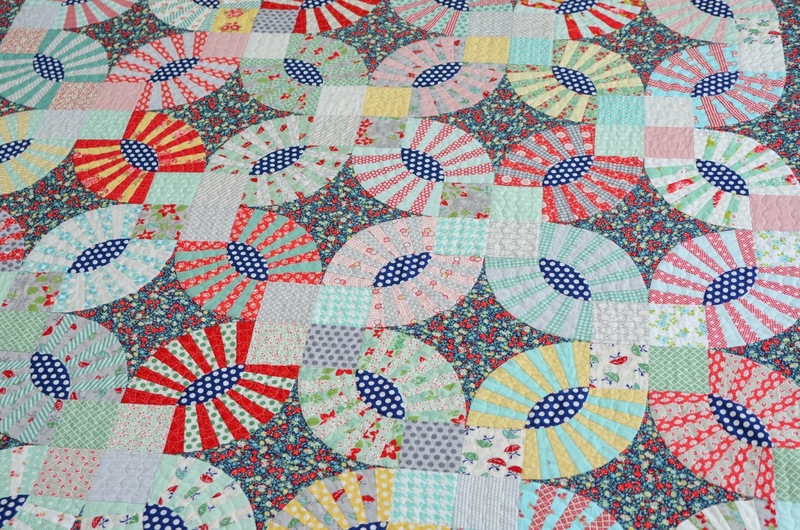 Hello, quilters! My name is Andrea and Cindy is my mom! She asked me to come here and do a little series with tips about photographing quilts. (The truth is, my mom takes AWESOME quilt photos and probably could have written these posts, but she asked me and I’m happy to do it!) I love photography and teach a beginner's workshop. You can find my website here. First, I want to let you know a little bit about me. I’m married, I have three amazing kiddos. My girls are 8 and 6 and my little guy is about to be 3. When my oldest daughter was born, I decided to stay at home with her. I was extremely lucky to have this option. But, I struggled a bit with the loss of self that comes with full-time motherhood. 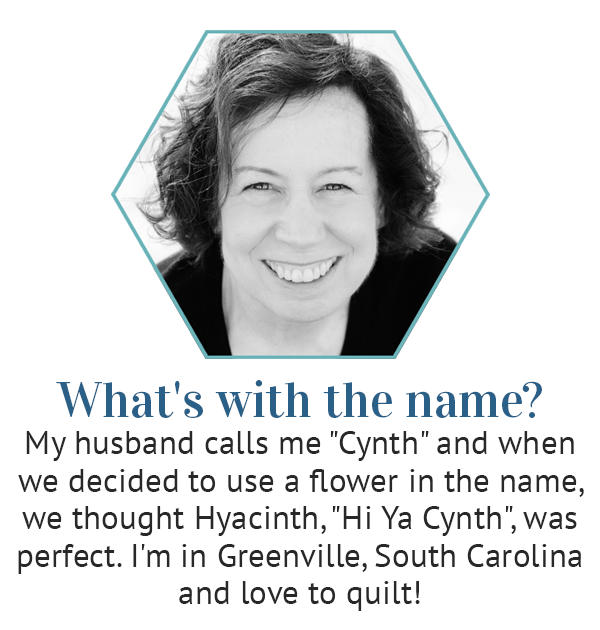 As you know, I grew up with an amazingly creative mom and I saw how quilting enhanced her life. She used both her brain and her creativity, she had a place to learn, and she connected with other women. With that example, I knew I wanted a creative outlet of my own, but quilting was not for me. In a moment of divine inspiration, I went to the local camera store and bought myself a fancy camera. I dived right in, taking classes, practicing, and reading all I could. Now, eight years later, I’m so thankful to have my own creative outlet. About a year ago, in another moment of (perhaps) divine inspiration, I decided to start teaching a beginner’s photography workshop. You can read more about my workshop here. 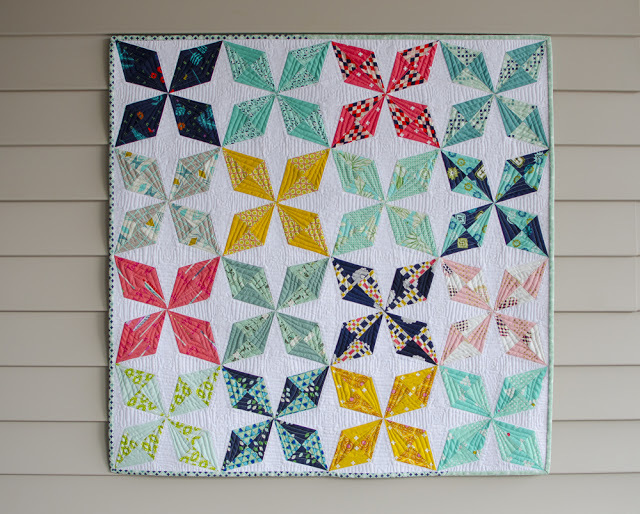 Today, and for the next 2 posts, I’m going to share some tips to help you take better photos of your own quilts and sewing projects. The Internet has created a virtual quilt show, where you can see and share the work of quilters all over the world! It’s really fun to be able to share your creations with others. However, if your photos are unclear, grainy, or yellow, the rest of us won’t be able to appreciate the full beauty of your hard work. Before I dive in, I have to say, this was WAY harder than I expected. I typically photograph my uncooperative kids. So, when I knew quilts would be my subjects, I figured it would be easy. (Quilts sit still and don’t fight with their sister.) But photographing quilts was much more challenging than I expected! I’ll share some of the photos I took, and I'll use some photos that were taken by my mom. For this first post, I’m going to ask you to TAKE US TO THE QUILT SHOW! As a kid, I went to my fair share of fabric shops and quilt shows. 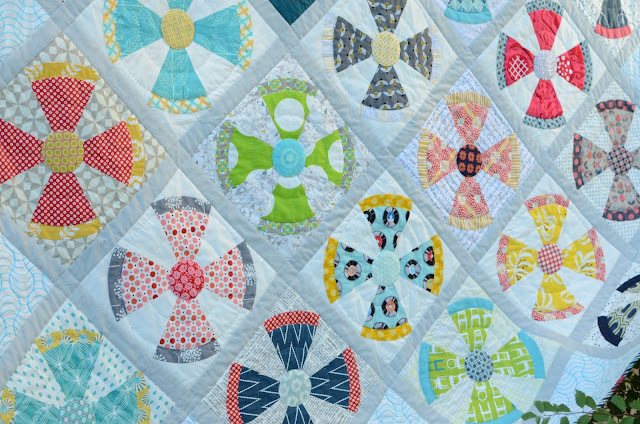 Today, with the Internet, you don’t have to drag your kiddos to a quilt show…you can enjoy a world’s worth of projects from the comfort of your own home. When you share your own projects on the web, you bring us all to your quilt show! What do you want to see when you go to a quilt show? First, you’ll probably notice the quilt in its entirety, hung up for all to see. 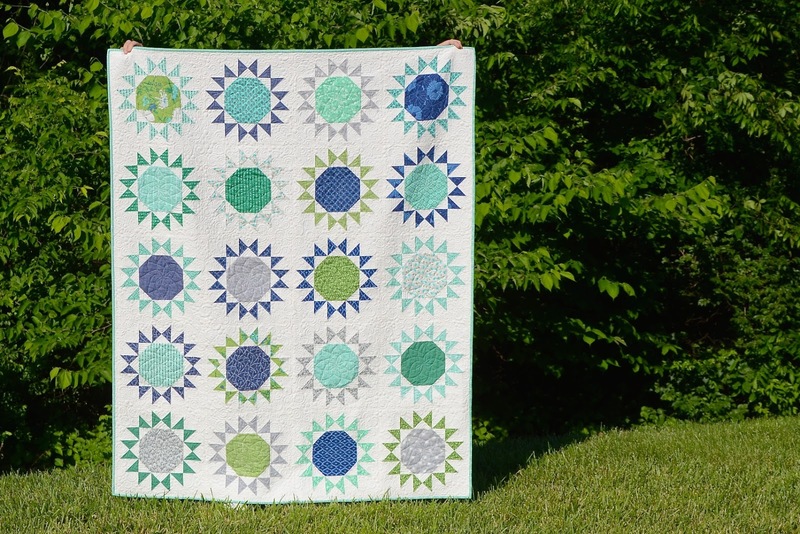 We want to see YOUR whole quilt too! This can be a bit challenging! It’s not easy to get a good shot of an entire quilt. If you have someone around to help, head outside and have him or her hold up the quilt. 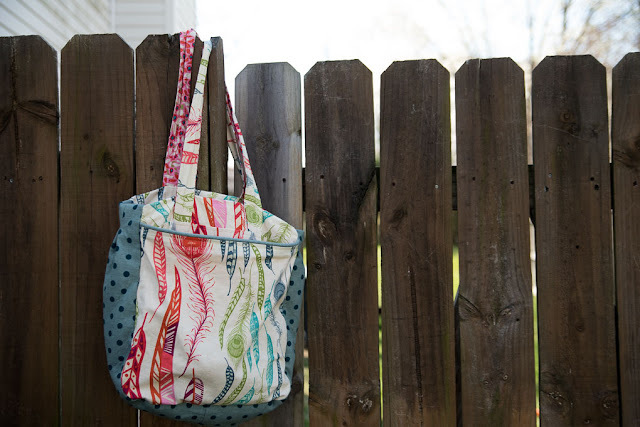 Or, you can hang it over a fence, attach it to a wall, or if small enough, to your own work board in the sewing room. This small quilt was duct taped to the siding! So the first step is to show us the whole thing. Do your best to square up in front of the quilt, giving us a view from right in front of the quilt. Once you see a quilt you like at the quilt show, I bet you walk over to get a closer look. 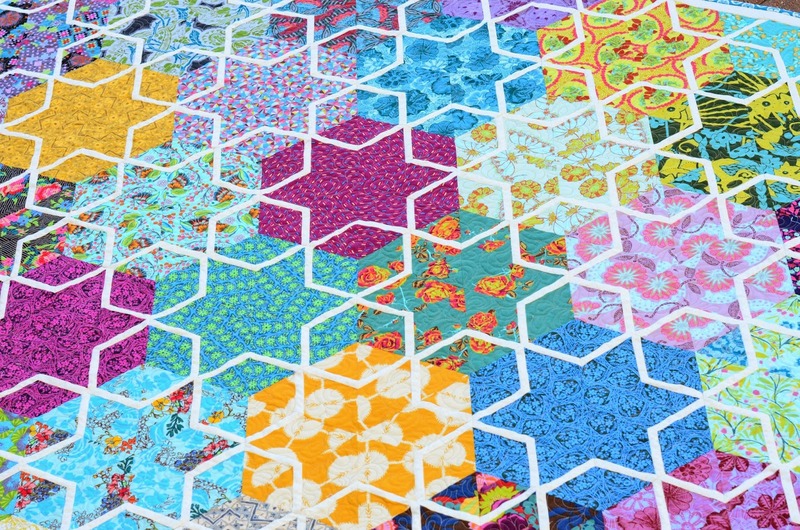 We want to see your quilt up close too! Take some shots of your quilt up close. Start with a photo of one or two blocks together. Then, get even closer. At a quilt show, you might grab some white gloves to inspect the quilting. Quilting can be hard to capture. It is really important to have enough light to capture the quilting. Try moving your quilt near an open window. I'll write more about light in the next post. 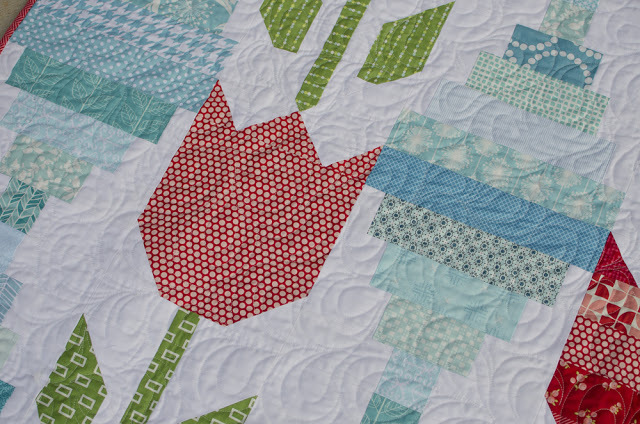 Focus on some plainer fabric so we are able to see the detail of the quilting. While thinking about all these different perspectives you also want to avoid distractions. How would you feel at the quilt show if your quilt hung next to the concession stand? The concession stand might have popcorn popping or coffee brewing. These sounds and smells might draw your attention away from the quilt. 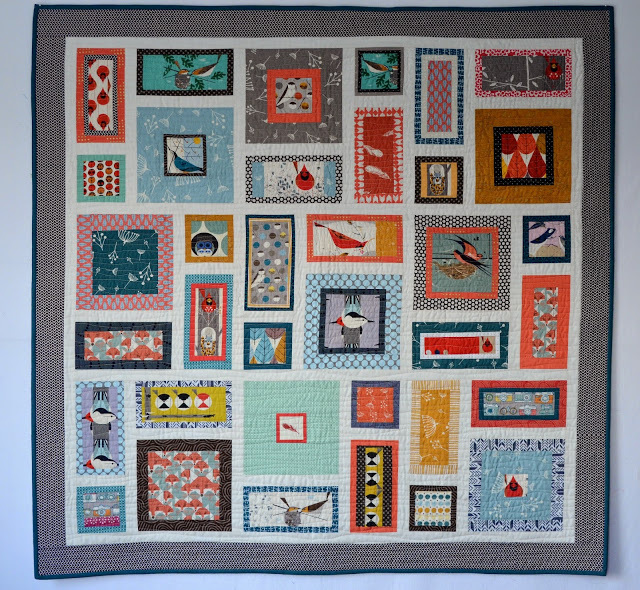 In our online quilt show, there won’t be olfactory or auditory distractions, but visual distractions can keep us from focusing on the subject of the photo…the quilt! It's really about keeping the photo as simple as possible so we can focus on the subject. Try not to have other elements competing for attention or drawing our eye away from the main focus of the photo. Cameras aren't selective when we take a photo. EVERYTHING we see through the viewfinder shows up in our photos. That's why it is up to us to make sure to include elements we want and to exclude elements that might distract from the focus. I'm using this bag (that luckily for me stayed at my house after my mom's last trip) to demonstrate. If we look at this first photo, we can see there are some distracting elements. 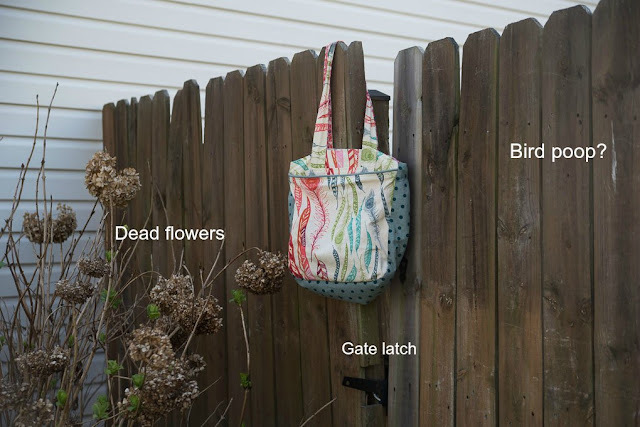 The dead flowers, gate latch, and bird poop all draw our attention away from the focal point of the photo...the bag! Aware of these distractions, I can make a few changes and create a more focused image. When thinking of distractions, think MCC..."move", "cover", and "crop." Move: The first thing we can think about in relation to distractions is moving. We can both move our bodies and move items within the frame. Here, I started by taking off some of the yucky dead flowers. I just pulled them right off the plant so they were no longer near the bag. Then, I actually moved myself. I got closer, so I could cut out a good amount of the extra space in the frame. Also, I changed my angle a bit. I don't love seeing the whole plant or the space between the gate. By moving my body to the left, I changed the angle I used to approach the bag and was able to remove distractions. Cover: The second trick we can use to remove distractions is to cover. In the photo above, the bag is actually covering a handle on the gate. I didn't want to see that handle so I used the bag to cover it. Sometimes we can change our angle so that one item blocks another. For example, one time at the beach with my family, I noticed a big ugly trash can. 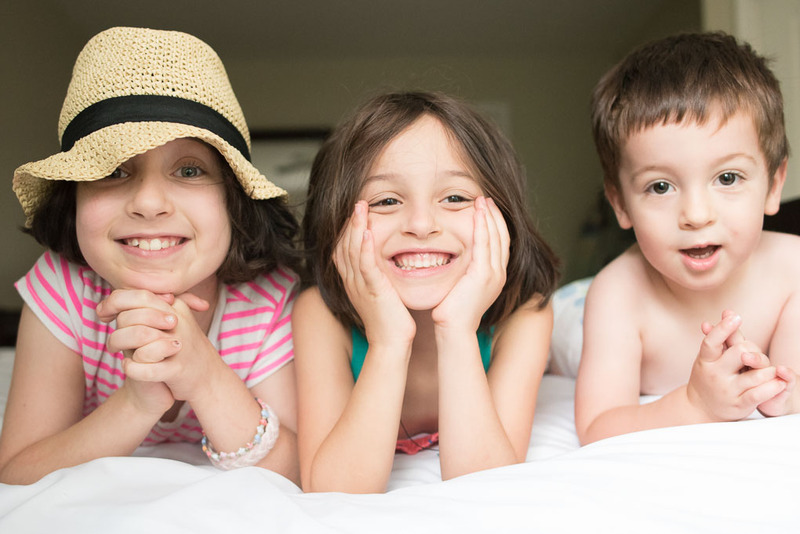 I moved my body so that when I photographed my girls, their bodies blocked the trash can. Crop: It's often so much easier to notice distractions after the fact. Every photo editing program allows you to crop your photos. Often, I'll crop to remove distracting elements from the frame. I recommend you scan the viewfinder, do a circle with your eyes, and find ways to remove any distracting elements. Or, study your photo on the back of your camera right after taking it. Is there something that might distract from the focus of the photo? How could you remove that distraction? Does this mean we can ONLY include the quilt or sewing project in your photos? Absolutely not! 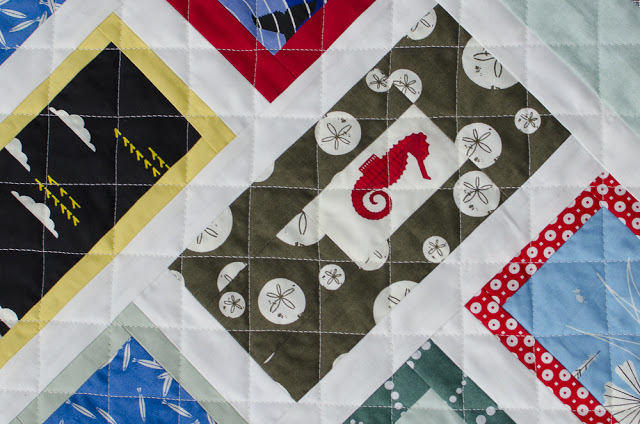 Think about the “story” of the quilt and include elements that would add to the story. 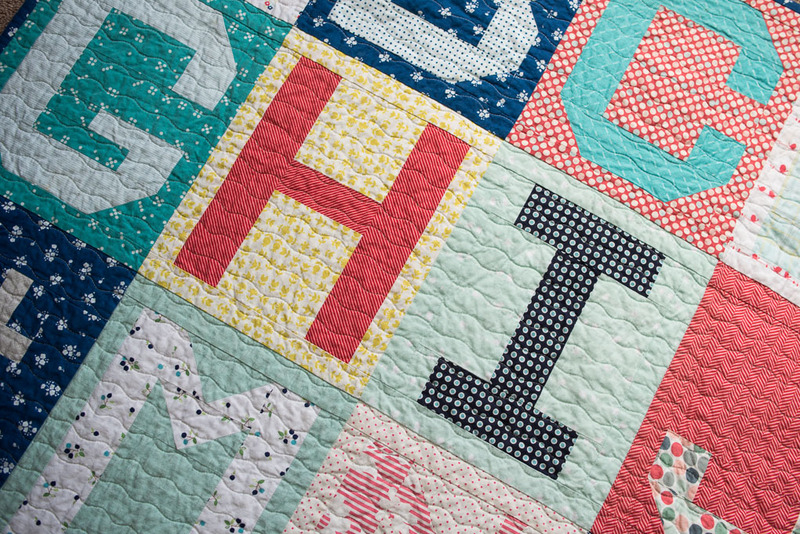 If it is a baby quilt, you might want to set up a stylized shot with baby items. Flowers and other pretty items can add interest and beauty to your photos. Include the person or people who will enjoy your hard work! Just keep out the things that might draw our attention away from your beautiful work! In the next post, I’ll be back to tell you about light and how you can use light to improve your photos. Until then, find me on Facebook or my website. I'm actually giving away TWO seats in my next photography workshop. You can enter once on my Facebook page and once from my Instagram account. The giveaway ends tonight (Monday) at 11:59 pm so be sure to hop over if you are interested! P.S. I'm offering a discount for anyone here who wants to sign up for my workshop. 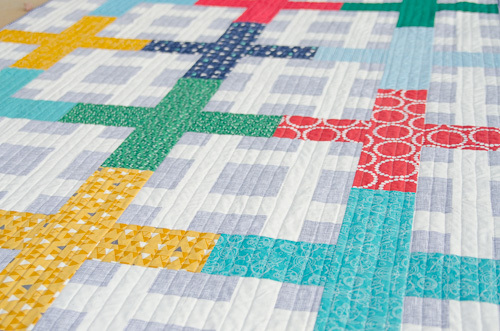 Get $10 off with the discount code "quilts" up until April 11. Thanks for this really informative (and fun to read) post on photographing our quilts. I'm certainly going to think differently the next time I take a pic of one of my quilts. How fun to team up like this with your daughter! So much usable information, and so clearly expressed! I too will be thinking of these the next time I head out with quilt and camera! Thank you, Andrea!!!! Great suggestions! I need so much help with my quilt photos. I'm SO happy you are offering this informative series this week! I'm hooked already! Great post! Thanks so much! Very helpful post - thank you!